DEWALT® has added the ToughSystem® Cooler and ToughSystem Waterseal Drawers to its line of ToughSystem storage products. Featuring a lid with two cup holders and a bottle opener, the ToughSystem Cooler has 27 quarts of storage space and reportedly can retain ice up to five days to keep beverages cold. 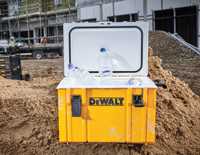 The cooler can be stacked with any ToughSystem module using its side latches and is compatible with DEWALT racking devices for stability and security during transit. The ToughSystem Waterseal Drawers unit is IP54 dust-resistant with two deep drawers for safe storage of tools. The unit features ball-bearing slides for convenient opening and side latches said to enable connections to other ToughSystem toolboxes. 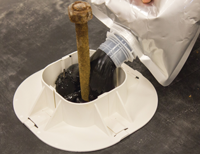 Mule-Hide Products Co. Inc. has introduced its line of ShapeShift® Pitch Pans with MP Liquid Sealant. Designed for use on low-slope roof systems, ShapeShift Pitch Pans are white and consist of 3-inch-long straight sections reportedly made of a high-strength polymer and 2- by 2-inch radius corner sections that feature interlocking joints that snap together to form square and rectangular pitch pans. MP Liquid Sealant can be used with EPDM, TPO, PVC, metal, spray polyurethane foam, elastomeric acrylic coating, smooth polymer-modified bitumen and smooth built-up roof systems and is available in white, black and gray. The sealant is packaged in four 2-liter foil pouches per pail.